Requirements in this Standard apply to power operated doors for pedestrian use, which open automatically when approached by pedestrians and some small vehicular traffic or by a knowing act. Included are provisions to reduce the chance of user injury or entrapment. Power operated doors for industrial or trained traffic are not covered in this Standard. 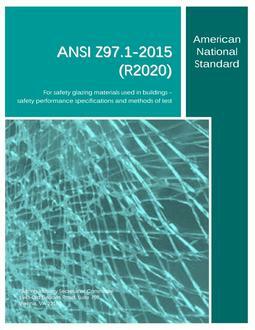 Where this Standard contains specifications relating to minimum or maximum dimensions of various components of power operated doors for pedestrian use and some small vehicular traffic, such dimensions are included to provide user protection for what are, in the industry, standard application conditions. This Standard does not apply to custom design installations. This Standard does not apply to power assist and low energy power operated doors. 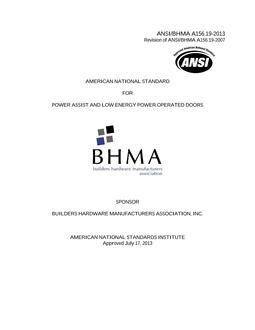 Refer to ANSI/BHMA A156.19 for Power Assist and Low Energy Power Operated Doors.